When planning the master suite and office addition, the tight site and steep slopes dictated that we go up, and preserving the open beam ceiling in the living room was a priority for the owners. We were able to push the new master suite away from the street and cantilever it over the driveway. We skewed orientation of the addition to the views of Downtown Los Angeles to the south, which creates unique conditions at the stairway, adding to the drama of the design. The directive from the owners was to maintain the character of the house but with a modern and open interpretation. 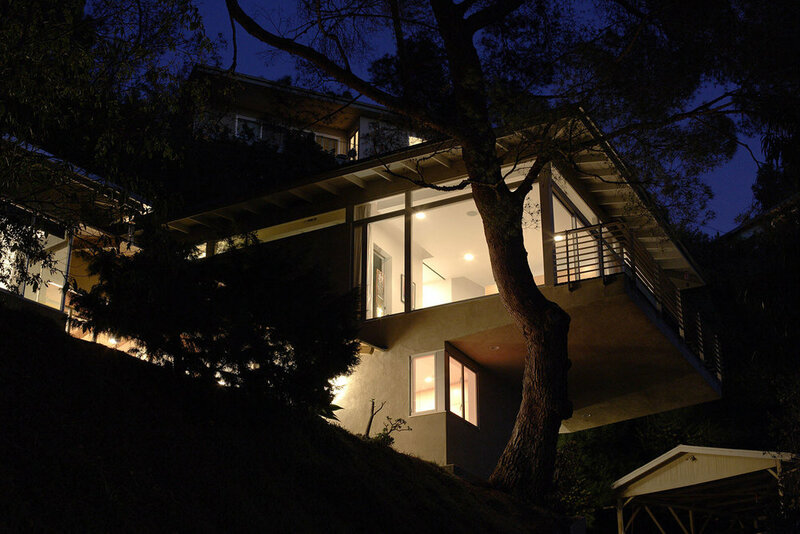 The addition is nestled between the existing pine and the steep hillside to the rear, with expansive views of the landscape and the city.